You slaved over your marketing plan, carefully crafting every word, graphic and customer-facing marketing material. Finally, finally, they’ve arrived at your website. What (and where) next? Your website is crucial to your business – every element, even the smallest, must be paid pain-staking attention. Then test, test, test. First things first – what is a conversion for your business? This won’t be the same of all businesses, and may include one or more action. For some, it will be a phone call or email. For others, it might be an eBook download. Identify the primary goal, and then any secondary conversions that are of lesser impact and importance. What is the role, or roles, that your website should play? Should it educate, inspire, guide? Clearly, an ecommerce website should aim to make a sale. But to make that sale, what else must it do? Should it educate the audience – helping them make the right selection of a product? (think season fashion guide – for a clothing website, or health issue FAQ – for a supplement website). When requesting information (such as with an email opt-in or traditional contact form), ask for as little information as possible. With every field you add and piece of info you request, you impact the chance of your visitor making it all the way to the end (just take a look at this example – where just one added form entry decreased conversions by 11%). Your calls to action should be tangible and action-focused – being clear on the action that you want from your visitors in short, punchy bursts. In all other areas outside of your calls to action, make sure your copy is clear and compelling, without the bluster and hype (most consumers can spot BS content from a mile off). Video can help you connect, better, with your audience (especially if you sell services, or own a business in which YOU are your brand). ‘Above the fold’ refers to the area that’s immediately visible upon landing on your website (without scrolling). This area is the most critical of any page, and should be the place where your opt-in boxes and other conversion-focused features appear. Every website must build trust. Without it, no matter your product, industry or market, you won’t get that conversion. Here are my top tips for a website that instates almost instant credibility (and along with it, trust). Every one second delay in the loading speed of your website will hit your conversions hard (7% hard). So it pays (literally) for your website to be reasonably speedy. I can’t stress this enough: a high-converting website is one that IS TRACKED, TESTED AND CONTINUALLY ASSESSED. That makes a programme such as Google Analytics a critical tool in your profit-building arsenal. Google Analytic newbie? Here’s a solid quick-start guide. Alongside this tool, you’ll need to keep a journal of your marketing activities and a running list of any tweaks and changes you’ve made on your site, so you can tie up any rises and falls in conversions back to your on- and off-site activities. This final pointer is the most important of all, as no two websites are the same, and what works for one brand won’t work for another. Once you hit upon something that works, try to understand why then recreate throughout the rest of your website. 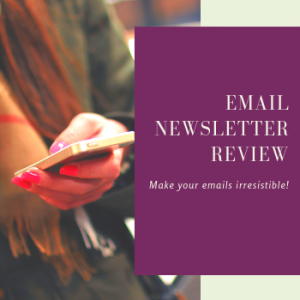 If you like the tips you read in this blog post, why not sign up to receive my weekly newsletter? You’ll get the latest marketing tips straight to your inbox and can start implementing them right away.